I took off this weekend to test some BRCKs out in some of the more rural parts of Kenya. 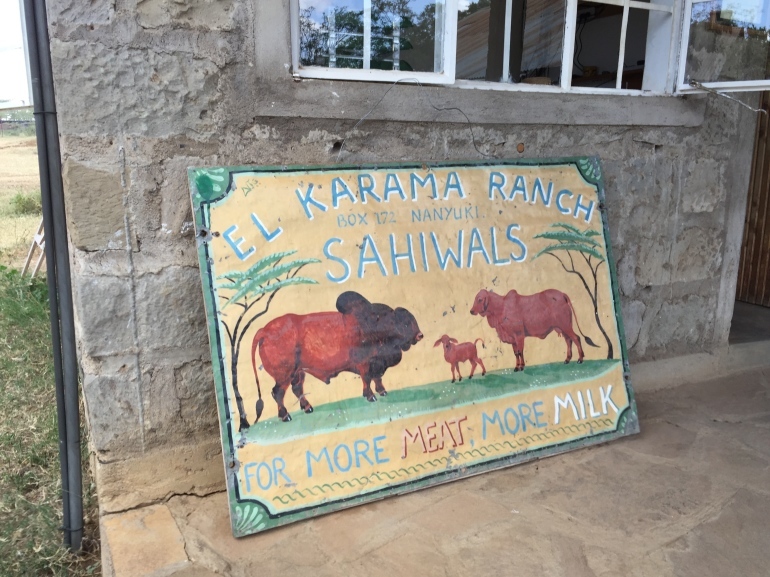 In this case, I was invited by Michael Nicholson who runs the cattle part of the El Karama Ranch situated near Nanyuki at the foot of Mount Kenya. The ranch is approximately 17,000 acres, and it has both a safari lodge and a lot of wildlife on it, as well as a 700-head cattle ranch. It’s an impressively well-run operation, and I got to see much of it. 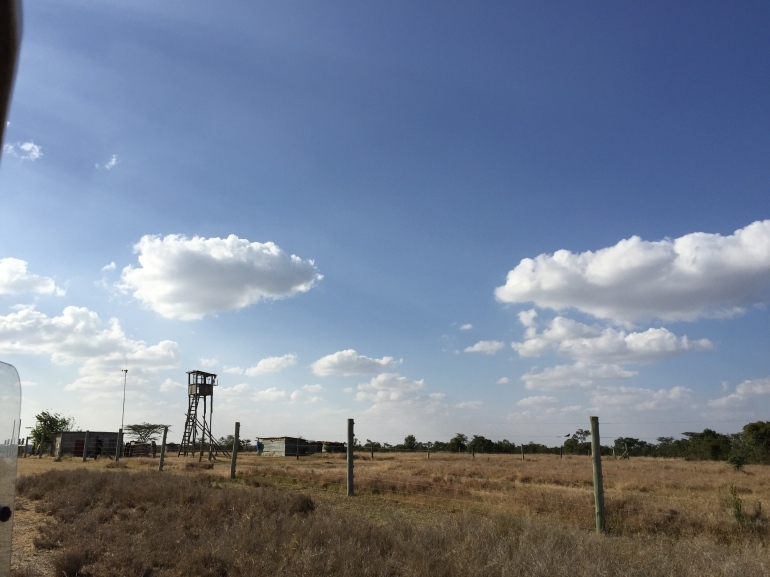 It turns out that the ranch is about 13 kilometers from the nearest mobile phone tower, and with a normal phone sitting out at their gate, you can get some spotty edge connectivity. 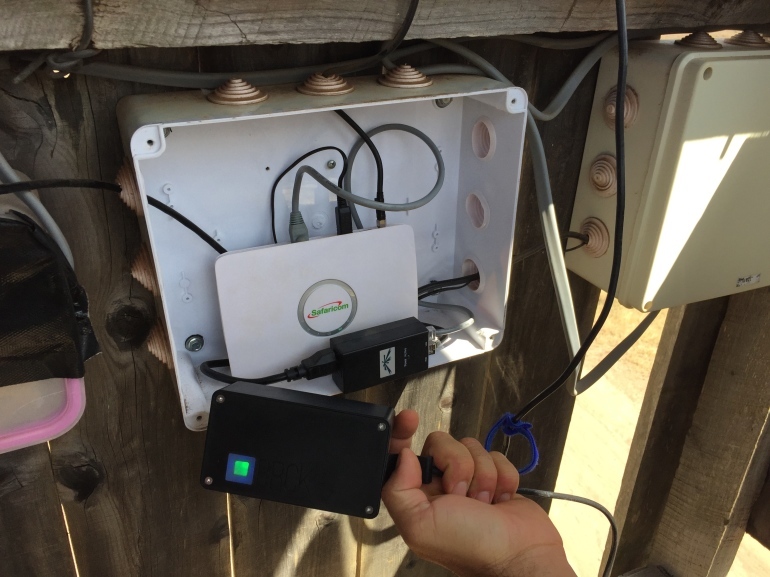 Fortunately, Michael is a tech-oriented type of rancher, so he was already familiar with modems and routers, and had educated himself on the types of antennas and WiFi repeaters he’d need. There was a lookout tower at the gate that already had two of Poynting’s amazing long-range directional antennas (which we call “swords” as they look like a weapon from a fantasy game). He had a working setup, but his biggest problem was the modem would randomly shut off. This isn’t a problem on the BRCK, because as soon as the modem loses connectivity, we tell it to search again and reset and reconnect. 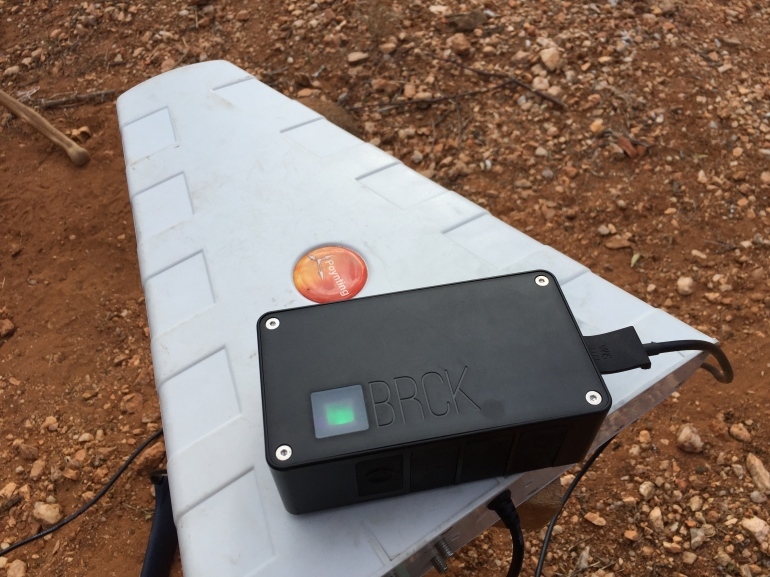 A simple solution would be for Michael to replace his current Safaricom modem with the BRCK (see below). 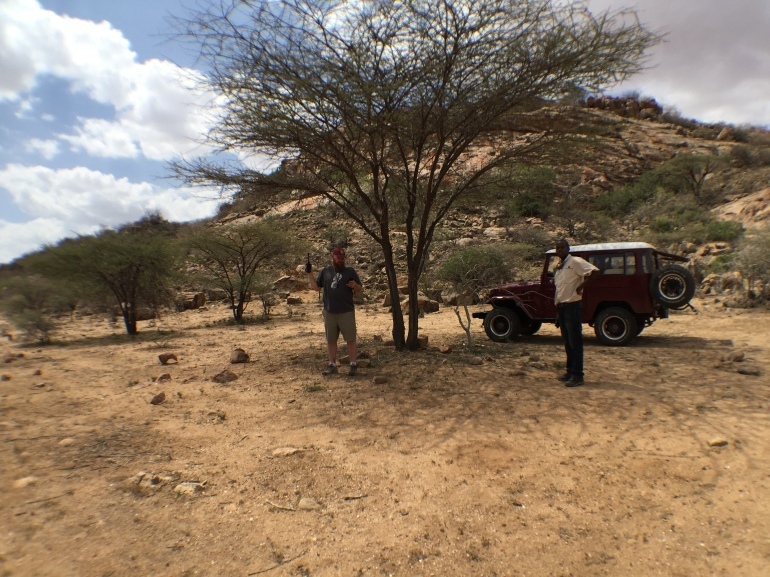 The next day I took off up further north, past Isiolo to the Samburu area around Archer’s Post. This is a dusty, dry and hot land fed by the Ewaso Nyiro River. 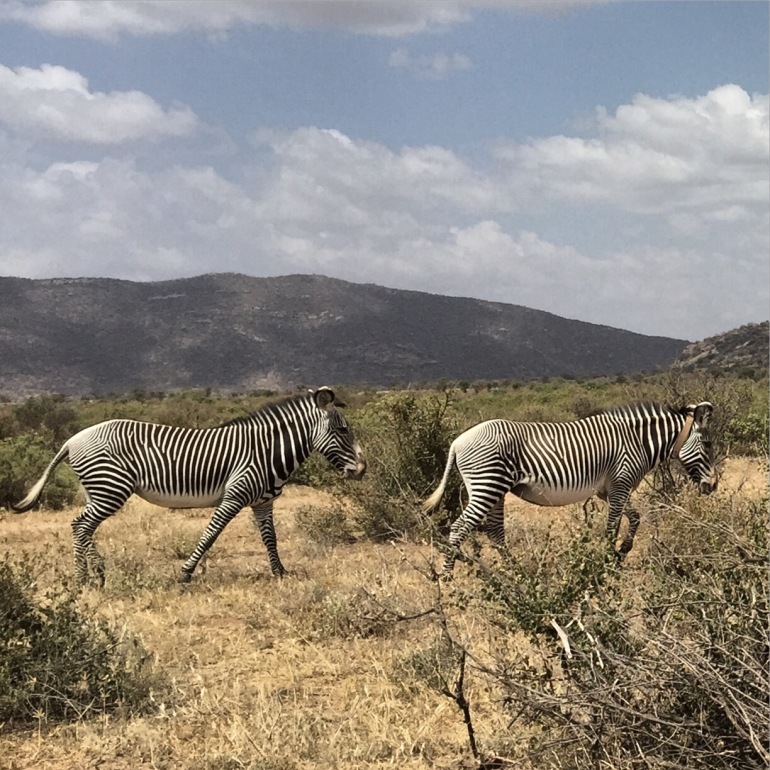 The wildlife research teams at the Grevy Zebra Trust and the Ewaso Lions had asked if we could test out if they could get connectivity. 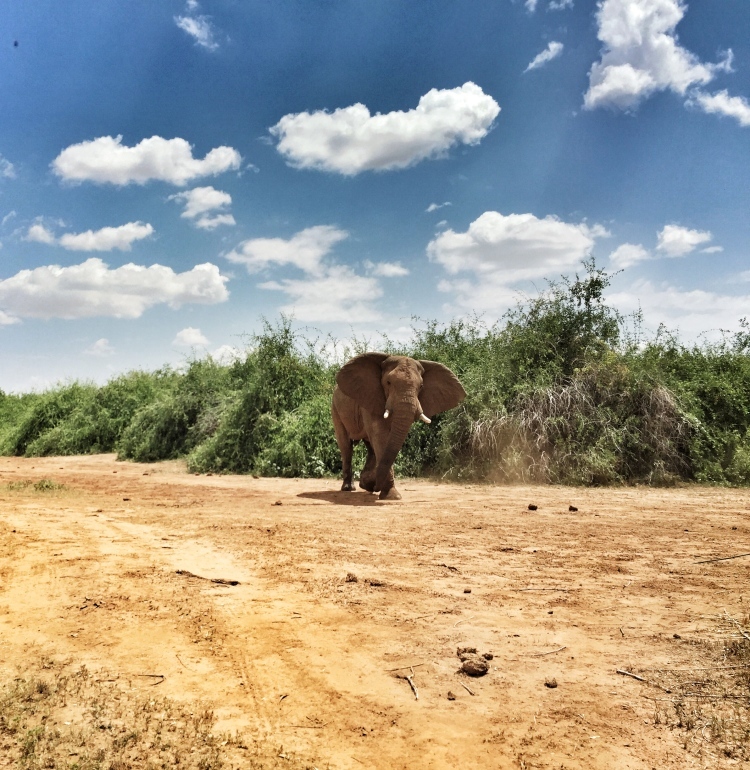 It turns out that to get to their camps you have to drive through the Samburu National Wildlife Reserve, which is amazing and has plenty of animals of all sorts. We saw everything from crocs and elephant to Grevy zebra and oryx. As fun as that was, it took us 1.5 hours to get through the park and many kilometers beyond to get to their camps. These teams are in real bush country with no towers anywhere around them. However, like almost anywhere you go in Kenya, there’s always some random tree that you can stand under and get connectivity (that’s me at said tree, above). They knew where these were, so we started to visit the locations to see what might work. 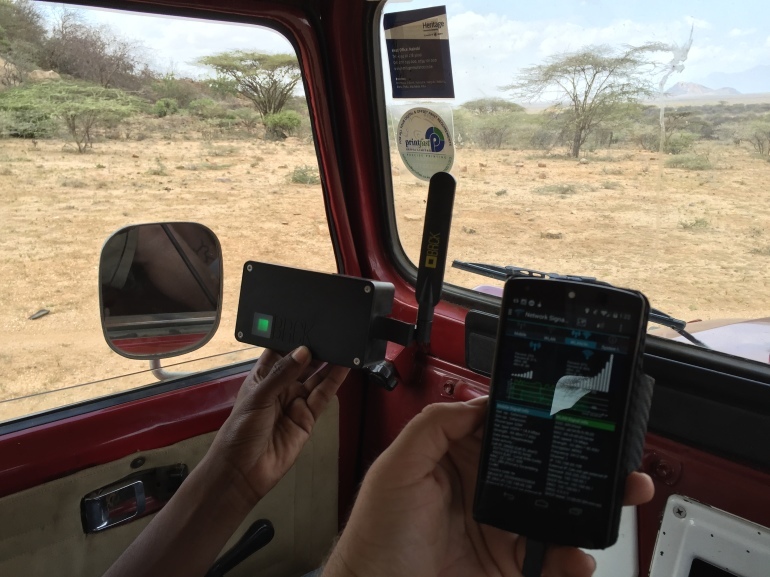 Of the 5 areas we tested, one had a strong signal but was a couple kilometers from the camp. 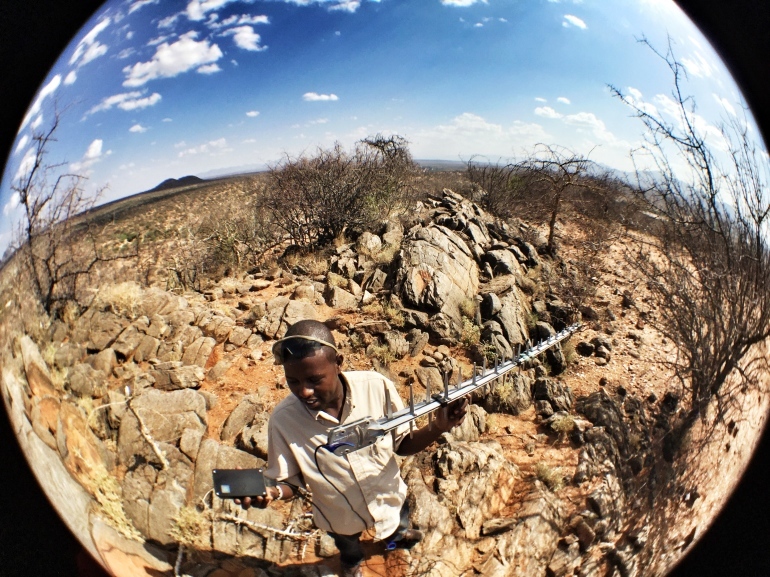 Another had a weak and usable signal near camp, and one had a possible signal in the middle of the Ewaso Lions camp. Very positive, and doable! In the testing kit, I take a couple directional antennas as well as a small omnidirectional antenna to walk around with. On top of this, I have a way to mount an amplifier (booster) in the car to increase the signal gain on the antennas. It’s a great bit of testing kit, and it proved out incredibly well. My suggestion to them is that they’ll need to raise a small pole on the top of their hill. Add a Poynting antenna, Voltaic solar panels for power, a BRCK and an amplifier. If they do this, we’ll likely test out our BRCK Extender at this location as well, which increases the WiFi range from about a 10m radius to approximately 900m. Since both the Extender and the amplifier need external power, there will need to be a small battery which is charged via solar. This whole concoction will run just over $1000 and should be fairly hands-free once setup. It turns out that BRCKs end up being a great solution for some of these rural and off-grid type places. While we can’t drive everywhere to do testing for everyone, we do try to get out and see what’s going on and see if we can help. It gives us a better understanding of our customers knowledge, and also a better feel for their pain points.